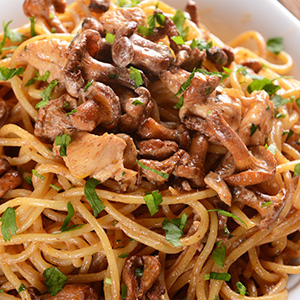 Update basic chicken pasta with garlic, flavorful sautéed mushrooms, white wine, and fresh parsley. 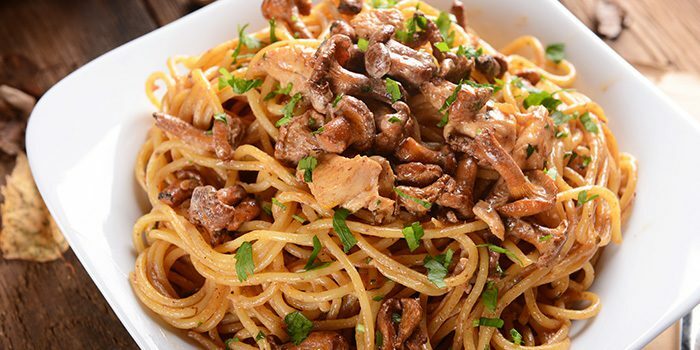 Common button mushrooms are great in this recipe, but if you want to amp up the flavor or impress someone special, choose porcini, morel, oyster, or other wild mushrooms for your chicken and mushroom pasta. Heat oil in medium saucepan over medium-high heat. Add chicken, onion, and garlic; cook, stirring frequently, for 3 to 4 minutes, or until onion is tender. Add mushrooms; cook, stirring frequently, for 2 to 3 minutes. Add wine and broth. Bring to a boil, stirring occasionally. Remove from heat. Place pasta on serving plate; top with chicken mixture.